Dawn over the Gulf of Corinth. The world’s longest multi-span cable-stayed suspension bridge glowed over water which burned at the Battle of Lepanto in 1571. This white-strung, earthquake resistant bridge links the Peloponnese to mainland Greece. It is a masterpiece of engineering. As Greeks reel at the thuggery of neo-Nazi party Golden Dawn, and tremble in fear of returning to the bad old days of low wages, minimal pensions and huge inflation if they leave the eurozone, I want to keep in mind the enduring, wonderful things about their country. After the last elections in May, I was in Patras for a university conference and glad to be there. I wanted to show support. Greece is a large part of my life. I speak the language, I admire and love the culture and people, and they had woken up to find they had a crisis instead of a government. An untried alliance had taken a large slice of the vote; the extreme right-wing Golden Dawn had won 21 seats in Parliament. Despite the crisis, Patras University was doing brilliantly what universities are for: teaching and research. Its conference was on “Science and the Humanities”: a hot subject. Hay-on-Wye philosophy festival staged a “Science and Poetry” event this year. Occupying the forefront of intellectual debate is a rather different image of Greece from riots and food queues. Physicist Dimitri Nanopoulos talked about particles; I read poems about migrating cells from my book on migration, talking in Greek but reading poems in English. This however was Greece: people turned up to translate them, beautifully. These included Thomas Mavromoustakos, the chemist who gave me a lift from Athens. We drove along the route taken by Theseus when he rid Greece of the Bronze Age equivalents of xenophobic Golden Dawn: Sinis, who tied strangers between two bent trees then let the trees go, Sciron, who made them wash his feet then kicked them into the sea, and Procrustes, who fitted them into his bed by stretching them or cutting off their legs. Today’s only obstacles are motorway toll gates. As Professor Mavromoustakos steered through, he told me he’d done a theology degree in his spare time, so we talked about evolution: how within a year of The Origin of Species, the Archbishop of Canterbury and Christian novelist Charles Kingsley embraced Darwin’s work. “God works through the slow work of natural cause,” said one. “Better than making the world, God makes the world make itself,” said the other. At Patras, sunset lit the suspension bridge to gold. “I’ve written a poem about that bridge,” said the professor, who then stayed up until two translating my poem on the Church’s 1860 acceptance of evolution. How many professors of organic chemistry translate poems perfectly for a passing stranger? In Patras Science Park, I explored the Institute of Chemical Engineering Sciences FORTH/ICE-HT with its Director, Costas Galiotis, who turned out to have been a pupil of mine while doing a PhD in materials science at London University and, like Professor Mavromoustakos, doing an extra degree on the side: in Ancient Greek, which I was teaching at Birkbeck College. FORTH, the Foundation of Research and Technology Hellas, has come out on top as premier centre of excellence in Greece in every national assessment since 1985. From 1983 to 2011, it received grants from the Greek state and EU and returned a surplus. Like the new Acropolis Museum, it more than pays for itself. But in the past two years, state contributions have fallen 35 per cent, endangering its operation. I met researchers on fuel cells (the non-polluting “engines” of the future); on catalysts for producing hydrogen, fuel of the future; on air pollution units. The Institute co-ordinates the pan-European PEGASOS project, which investigates relationships between atmospheric chemistry and climate change, and has just launched a research airship to test the atmosphere’s ability to cleanse itself. I also taught a literature class, but my poems on migration were upsettingly topical. More than 80 per cent of migrants entering the European Union now pass through Greece. Patras, Greece’s biggest port, is the Greek Calais. Immigrants from Pakistan and Afghanistan risk everything to jump ferries to Italy. Immigrant camps are demolished, people beg at traffic lights, Greeks are squeezed between desperate immigrants and their own need for work. Last month, Golden Dawn petrol-bombed an immigrant shelter. Students are particularly threatened: the young face 50 per cent unemployment. “I find it hard, what your poems are about,” said a girl. “If you were us, would you emigrate?” I said, in every way I could, I was sorry – but didn’t they think poetry should try to address, as honestly and deeply as it can, the pain of its day? And yes, if I didn’t have work, I’d have to emigrate. Some of the most valuable things in Greece, including the scientific and intellectual, are under threat. Half those students – Greece’s future, the counter-balance to Golden Dawn – will have to leave. Without consulting universities, the Bank of Greece has invested all their deposits in Greek government bonds, which threatens all academic funding. But the wonderful things are real, are there; and Greek problems are our problems too. We have our own Sinis, Procrustes and violence. And as our education system increasingly fails less-advantaged pupils, our society has increasingly come to see Greece only as a place for cheap holidays. This is our loss as well as theirs. Homer and Greek tragedy gave us the poetry of balance, of seeing both sides of a controversy, Greek and Trojan, and provided the West’s first insight into the divided self. The multiple Greek gods stand for warring elements in every self-conflicted psyche. Like the Acropolis Museum, Patras Archaeological Museum is new, beautifully designed, full of enthralling art and history. But it was empty. Tourists head only for the beach. 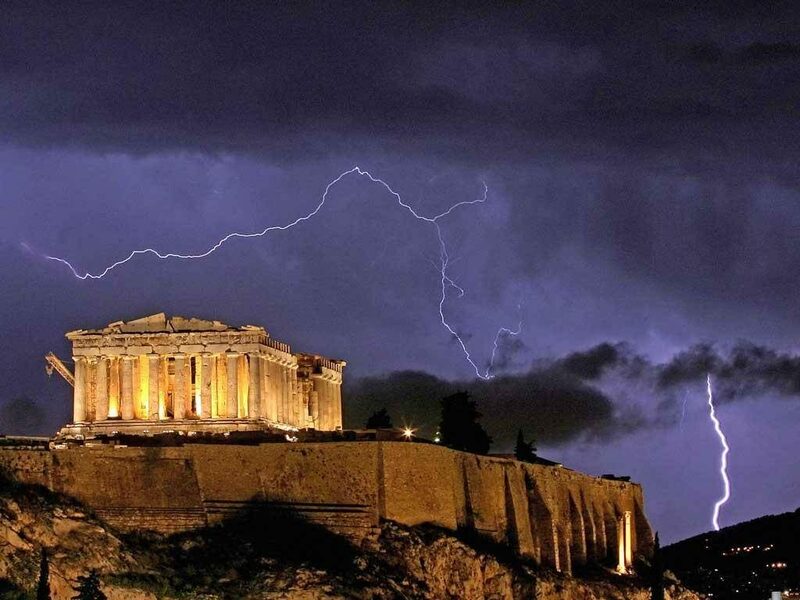 Is that an image for the emptiness of our own response to Greece not only in its current dark hour, but to what Greece has given us?